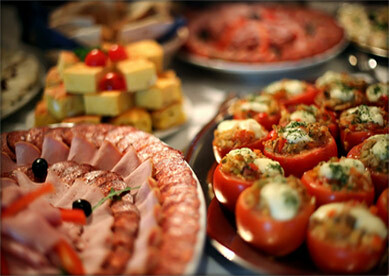 Signature Italian specialties from Romi’s are the perfect solution for your event. Whether it’s a milestone birthday, anniversary celebration, Superbowl party or a corporate meeting, we have a wide variety of catering options to delight every guest at your gathering. Artfully arranged and garnished with zest, our catered dishes look as great as they taste. Appetizers, salads, sandwiches, pizza and pasta are all freshly prepared with the best quality ingredients. Effortless for you, Romi’s delivers our perfectly prepared platters right to your venue. Our renowned dishes arrive at your home, office or facility ready to be served. Uniquely designed for each event, we offer you the choice of an elaborate selection of starters to desserts, or a few platters for a casual get-together. To talk about your many delicious options, please speak with Paula or Jerry @ 416 233 5885.